In the Orthodox calendar the feast of the Epiphany is called 'Theophania', meaning the manifestation of God. Epiphany is the most ancient feast, after Easter, relating to the Lord and is observed by the Christian Church on January 6. The first evidence attesting to the feast of the Epiphany comes from Clement of Alexandria who died about 215 AD. He relates that a Gnostic group observed the Baptism of our Lord on January 6 believing that it was at the time of Baptism that Divinity took the flesh in Christ. The date of January 6 was selected because according to some ancient reckoning the day began to grow longer on that date and so it was celebrated by pagans as the day of victory of light over darkness. In Rome, though, the day of the birth of the Invincible Sun was celebrated on December 25. In both East and West and practically at the same time, these two pagan festivals were replaced by a Christian feast signifying the epiphany (manifestation) 'of the sun of justice' and 'of the true light of the world'. The 25th of December began to be celebrated in Rome as the day of the Epiphany (Nativity), while in the East January 6 remained as the Epiphany day including both the Nativity and Baptism of our Lord. By the end of the 4th century, the 25th of December as the day of the Nativity was adopted in most of the East, and January 6 remained as the feast of our Lord's Baptism. When the Eastern Epiphany day was introduced in the West, the already celebrated Nativity on December 25th remained as such, and January 6th, although accepted as the day of Baptism, took the character of manifestation of Christ's Divinity to the pagan world. Hence, the Magi, figuratively representing the entire heathen world, were taken to be the recipients of the saving grace of the newly manifested Christ. It is only the Armenian Church in the East that still celebrates the Nativity and Epiphany together on January 6. 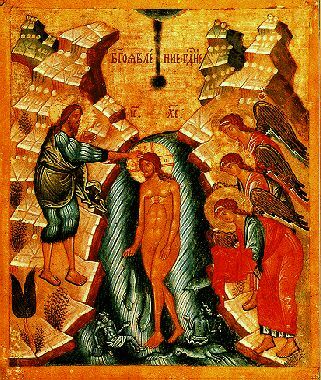 The most characteristic feature of the Orthodox day of Epiphany, or Theophania, is the sanctifying of waters by invoking the Spirit that appeared in the form of a dove over Christ at the time of His Baptism. The Orthodox receive sanctified water at the end of the special service of Epiphany and with it sanctify their homes, gardens, and other possessions while some preserve it for the entire year partaking of it at times of illness and other personal or family adversities. The twelve days between the Nativity of our Lord, December 25th, and the day of the Epiphany, January 6th, is called Dodekaemeron (twelve festal days) and is considered to be one continuous festive period. On December 26th, the Virgin Mary who gave birth to our Lord is honoured, and on January 1, the day of Circumcision of our lord is celebrated. The festive character of the period is observed by abolishing all kinds of fasts, apart from the day prior to the Epiphany when the service of the Great Agiasmos is performed.